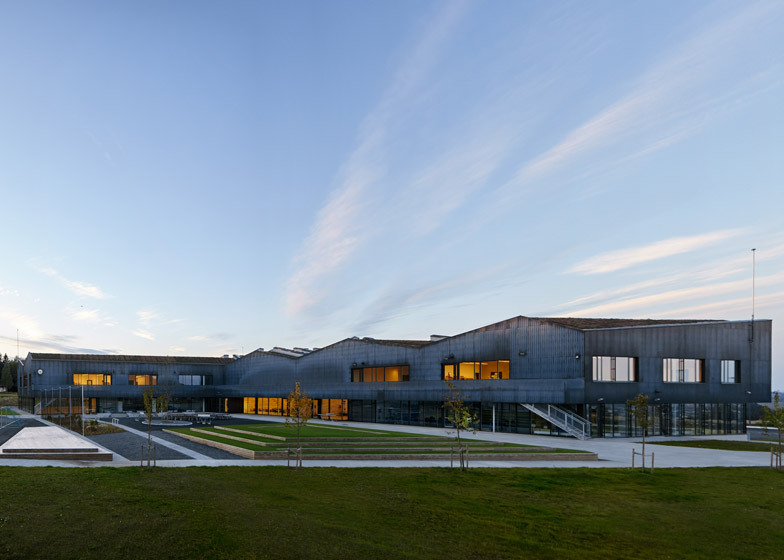 This school building in Norway was designed by Swedish firm White Arkitekter with copper walls and a zigzagging green roof to reference the forms and materials of a nearby historic industrial town (+ slideshow). White won a competition to design the Bråtejordet school, which is the first building to be completed in what will become a new residential area in Strømmen, a town 20 kilometres from Oslo. In response to a brief calling for a building that focuses on "concentration and peace for study", the design uses different levels to separate the school from the town, and to demarcate areas for teaching from those dedicated to play and communal activities. "The winning proposal is founded on clear structures, where spatial thresholds serve as natural boundaries, between school and community as well as between different parts of the school," said White in a statement. The first of the distinct spaces that emphasise the transition from community to learning environment is a yard ringed with trees that distances the building from its surroundings. The yard is separated into different areas, in a similar way to the layout of the nearby fields, with a social area incorporating picnic benches and a stepped seating stage in the area sheltered by the L-shaped plan. Steps lead from the yard to the school's main communal space, which is raised on a plinth to provide views out across the surrounding landscape through large glazed sections of the wall. The open foyer is also used as a canteen and assembly hall and is flanked by workshops, music studios, a library and offices. The faceted ceiling above the double-height space follows the shape of the roof. It incorporates skylights that bring natural light into the interior while emphasising the alternating angles of the surfaces. 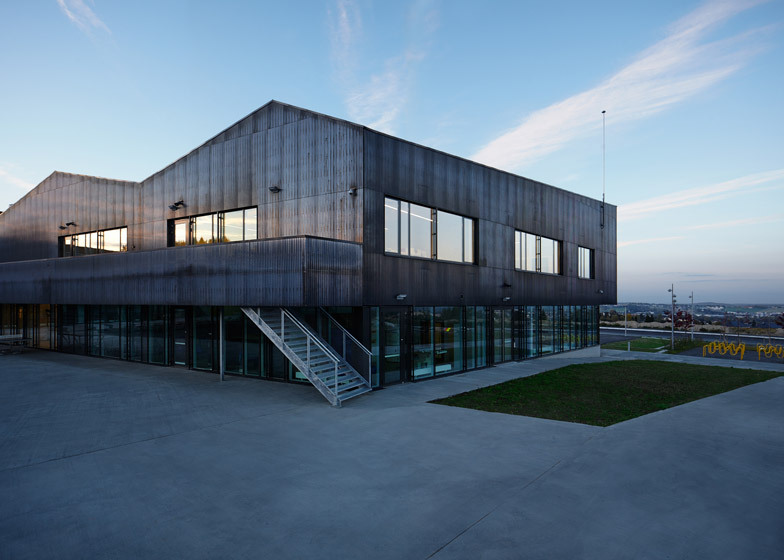 "The theme of the formation is linked to the surrounding agricultural landscape," added the architects. 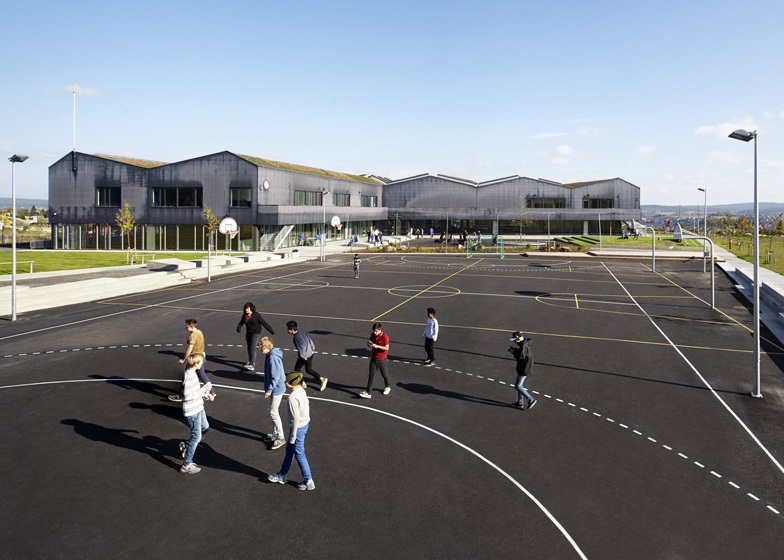 "The folded roof creates a silhouette that alludes to Strømmen's industrial history, as well as providing high ceilings with beautiful spatial sensations far from the image of a regular classroom." A wide wooden staircase connects the foyer with the main teaching areas on the level above. 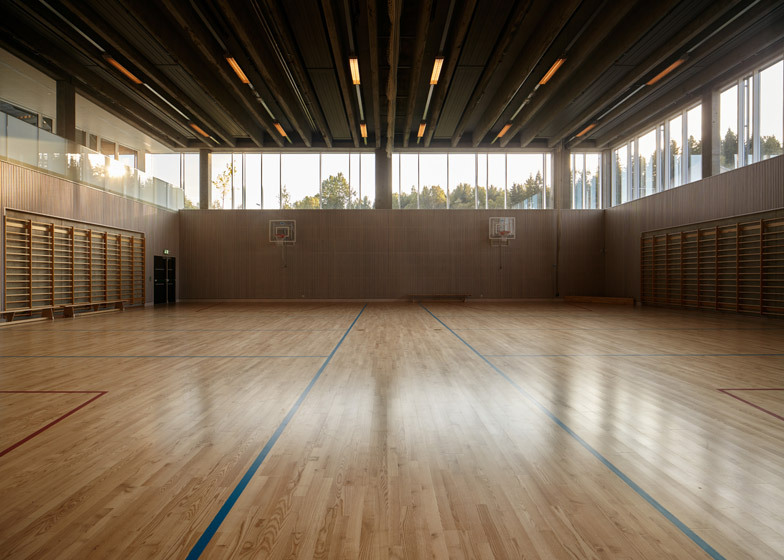 It incorporates treads of double height and width that can be used as casual bleacher seating. The upper floor is divided into zones for each year group, incorporating dedicated teachers' offices and break areas as well as separate staircases leading to the circulation areas on the ground floor. Classrooms are arranged around the edges of the building, facing away from the playground to minimise distractions. Each one forms the nexus of a unit incorporating an adjacent breakout space, toilet and student lockers. 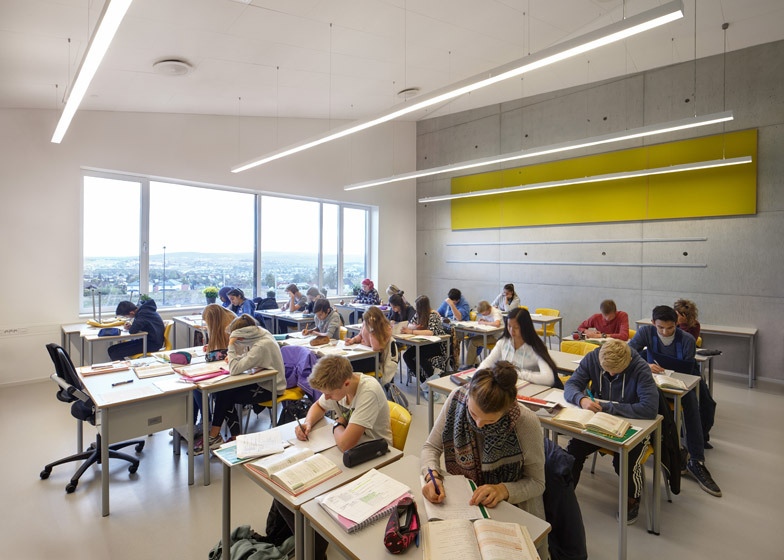 "The views are framed and the learning environments are less open than on the entrance floor, enhancing the sense of concentration and peace," said the architects. Another request from the client was for a building that will stand the test of time, so the materials used were "chosen to cope with hard wear and to age beautifully, without requiring too much maintenance". The exterior is clad in corrugated pre-patinated copper that creates gentle reflections, while light terrazzo flooring merges with the pale concrete of the yard outside. Photography is by Ivan Brodey. Team: Thomas Landenberg (head architect), Karin Jakobsson, Karin Sjödin (head of landscape), Jeroen Matthijssen, Lars Zackrisson, Christian Wahlström, Lena Osvalds, Mikaela Åström Forsgren, Daniel Hultman.